It’s still so cold even though it’s now March. 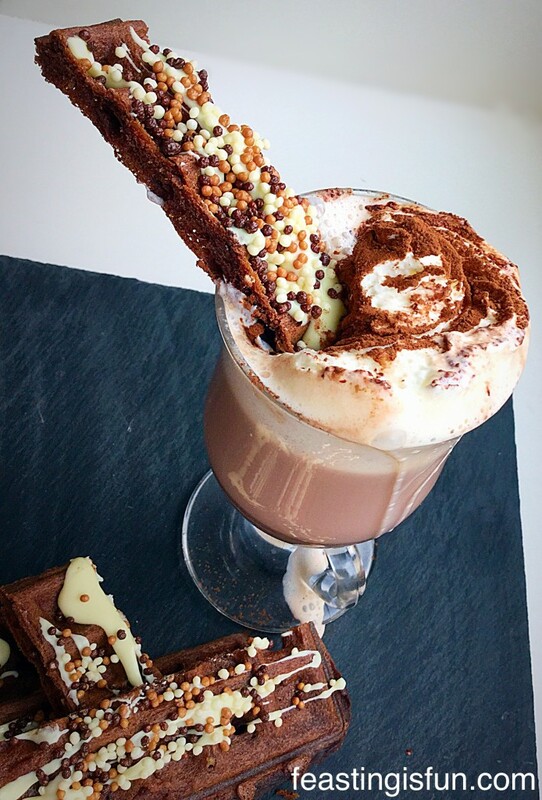 What better way to warm up than a hot chocolate with Chocolate Dunking Waffles alongside? 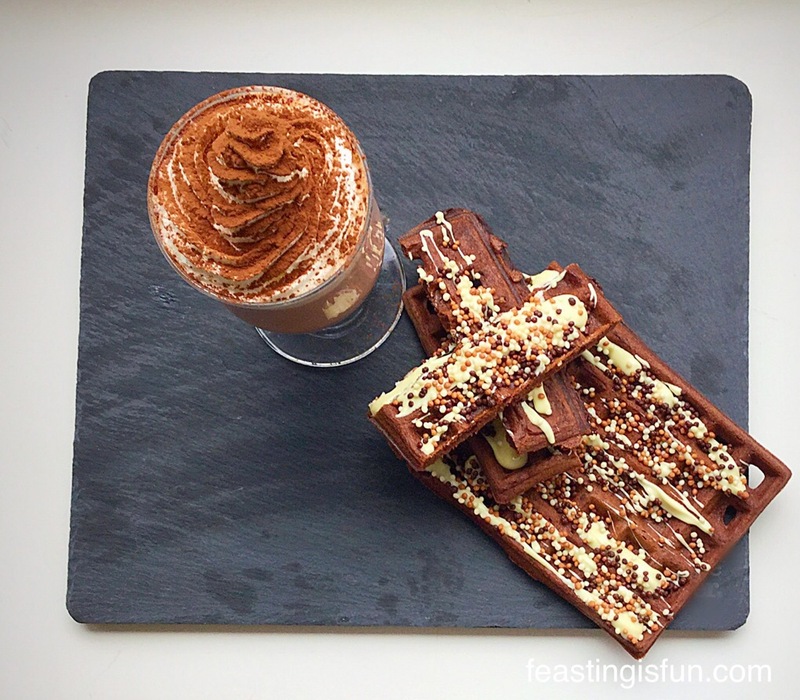 Ultimate delicious fun – these Chocolate Dunking Waffles bring out the kid in everyone. 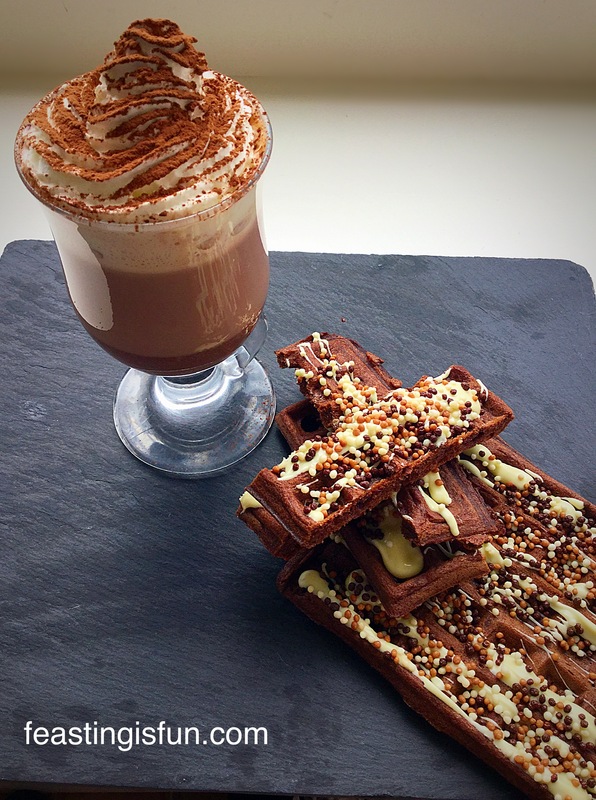 On frosty, wind numbing days these Chocolate Dunking Waffles are the perfect way to give your body a warm hug! Food should be fun. Licking the cake bowl out, eating the froth off your cappuccino with a spoon, always having two chocolates from the box (an absolute rule in our home). So why not make waffles fun? Chocolate Dunking Waffles and a hot creamy chocolate drink. Love at first bite! 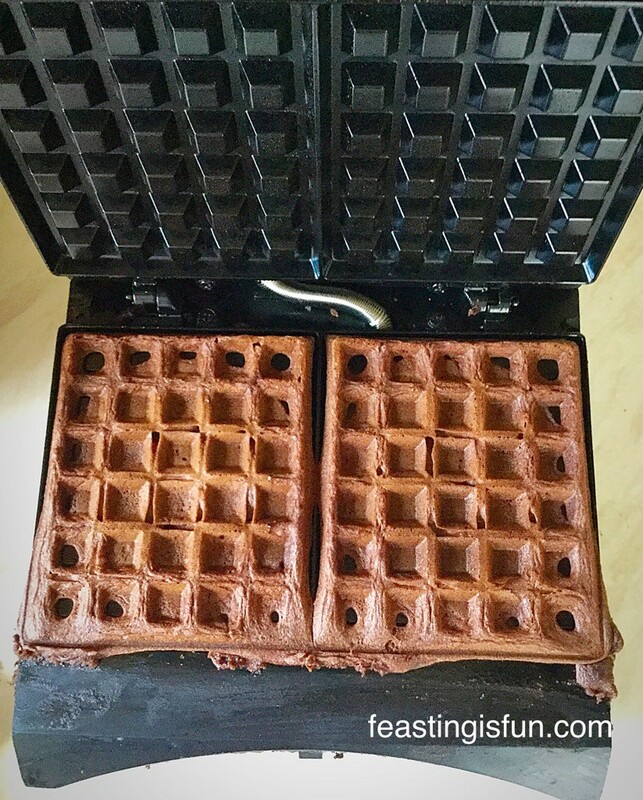 These Chocolate Dunking Waffles have a deep chocolate flavour and an almost fudgey, brownie like consistency. They are incredibly more-ish. You don’t have to worry though, as each waffle is cut into four fingers. Each waffle is drizzled in best quality white chocolate and then, for crunch, sprinkled with chocolate Crispearls. The combination is a taste bud party waiting to happen. Dunked into the hot beverage of your choice, the white chocolate melts a little as the spongy waffle soaks up the hot drink. The first bite is warm and chocolatey, with vanilla flavours and then the crunch of the Crispearls. 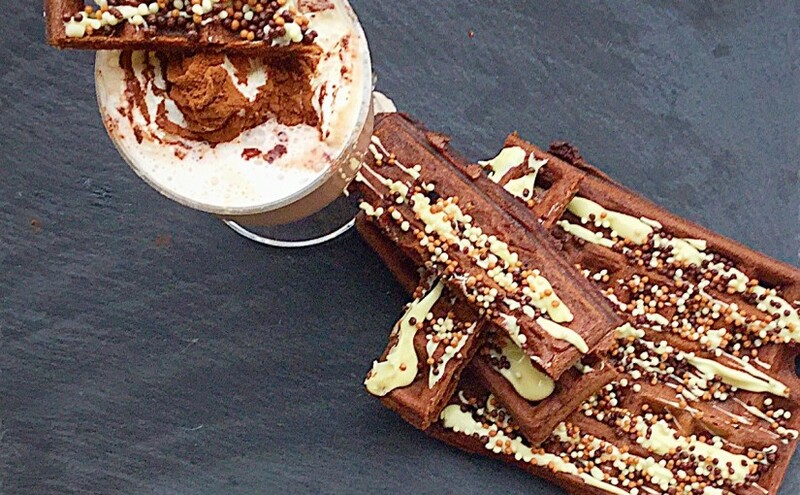 Trust me these Chocolate Dunking Waffles are so much more than the sum of their separate parts. If you love chocolate, then this is one taste sensation you do not want to miss out on. Anyone up for a game of waffle stacking??? I am an advocate of good table manners, however, sometimes it is fun to bend the rules a little – or even throw them right out of the window!! Chocolate Dunking Waffles do just that. Like toast soldiers are to the perfect boiled egg, these fingers of chocolatey deliciousness are perfect for dipping and dunking into your favourite hot drink. Like timing exactly how long to dunk a biscuit in a cup of tea, before it gets too wet, dunking these waffle fingers adds an extra element of fun to an already awesome combination. 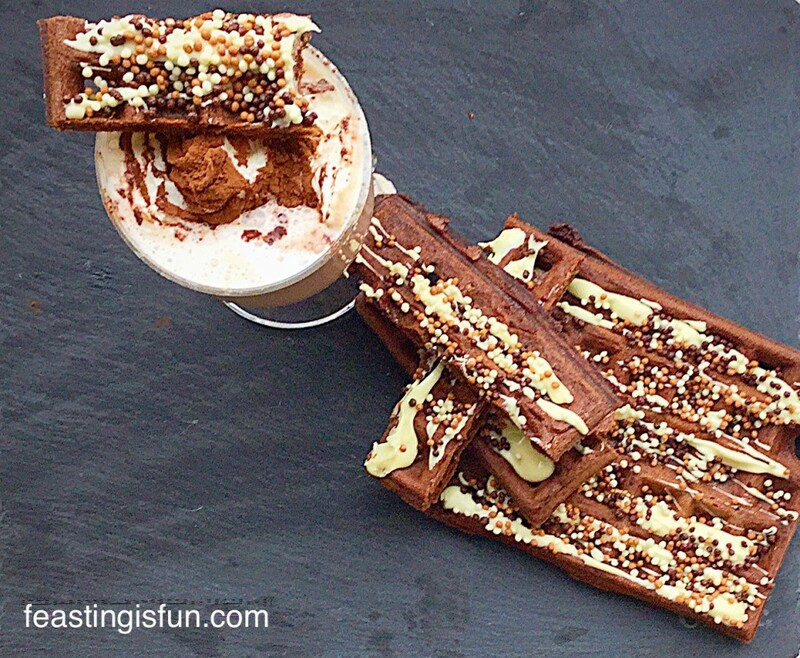 Chocolate Dunking Waffles – what drink would you dunk these in??? 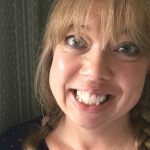 As it is the start of Fairtrade Fortnight, bringing awareness to the farmers and producers who grow and harvest some of our favourite products, I choose to use Food Thoughts Cocoa in my recipe. 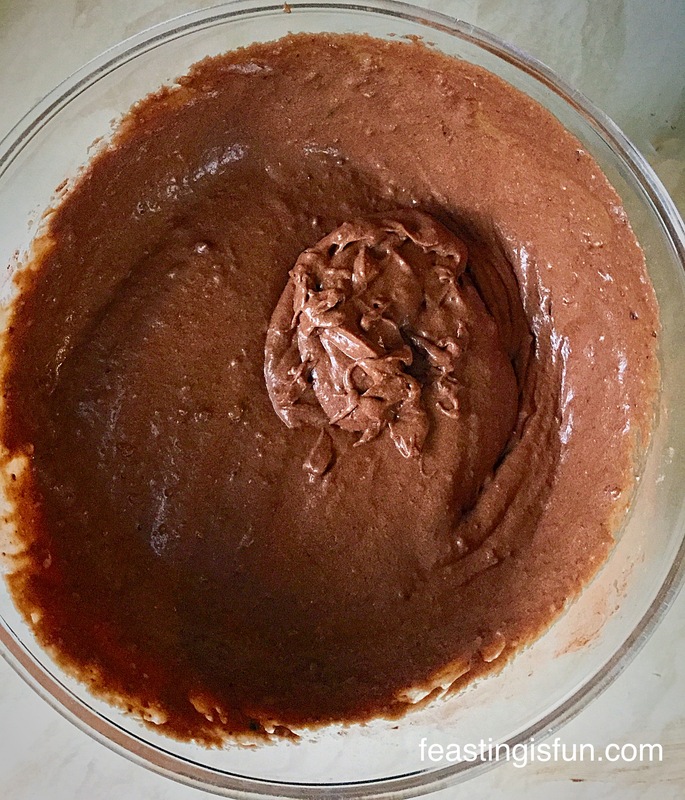 This cocoa is available from Sainsbury’s and has a wonderful deep cocoa flavour, perfect for using in my Extreme Chocolate Cookies, or other recipes requiring cocoa. 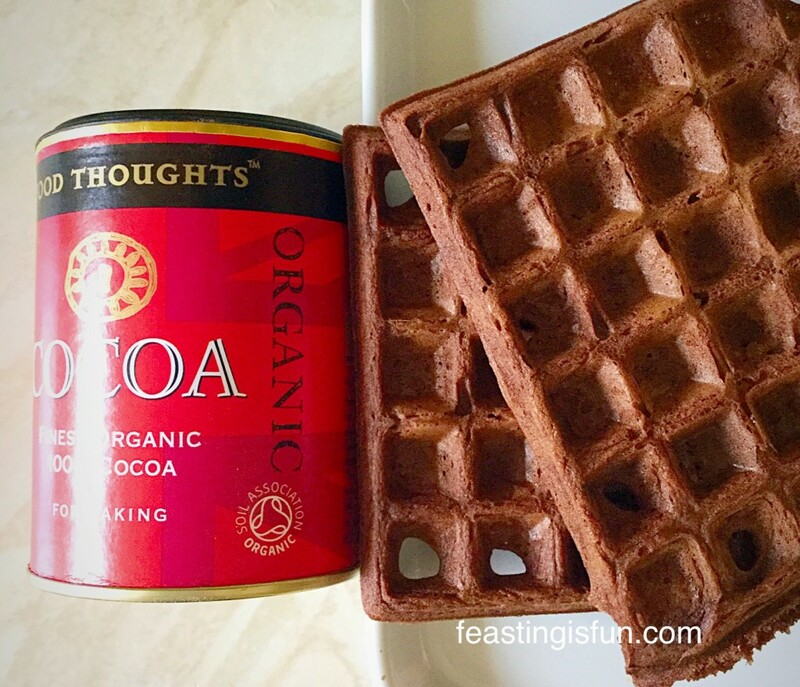 Food Thoughts Cocoa perfect in these waffles and for making the hot chocolate! Chocolate vermicelli, sprinkles or Crispearls. Method: Prepare your waffle maker according to the manufacturers instructions. For the Andrew James Waffle Maker each plate it brushed with melted butter before switching on to heat up. Whilst the butter is cooling crack the eggs into a large bowl. Give them a quick whisk. Add the milk, sugar and vanilla extract to the eggs and lightly whisk to combine. Once cooled weigh 150g of the melted butter into the egg, milk, sugar, vanilla extract mixture and whisk briefly to combine (wet ingredients). Weigh the flour and sift along with the cocoa, baking powder and salt into the bowl containing the wet ingredients. Gently mix both the wet and dry ingredients together until just combined – over mixing will lead to tough waffles. Place 2 dessert spoons of chocolate waffle batter onto the waffle plates. This is a slightly thinner batter than you may be expecting – that is how it should be. Close the lid of the waffle maker and cook for 6 minutes. After 6 minutes, using oven gloves to protect your hands, press the button to open the lid of the waffle maker. 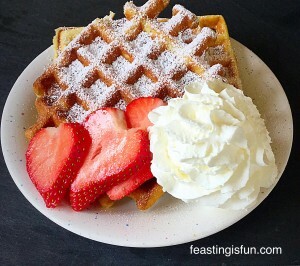 Using a wooden spatula (not metal as it may damage the non stick surface) remove the waffles from the waffle plate and place on a cooling rack or plate. Continue as before until all of the waffles have been cooked. A stack of Chocolate Dunking Waffles. Place the waffles on a cooling rack or plate to cool completely before decorating. Break or chop the white chocolate up into small chunks and place in a heat proof, microwaveable bowl. Zap for 20 seconds at a time, stirring after each zap. When the chocolate has almost completely melted remove the bowl from the microwave and continue to stir. The residual heat will melt the remaining chocolate. Layout all of the waffles on a worktop covered in baking parchment. Use a teaspoon to drizzle the chocolate over each waffle. Immediately sprinkle with your choice of topping. Once the chocolate has set cut each of the Chocolate Dunking Waffles into four fingers. Serve with a hot drink and a smile! 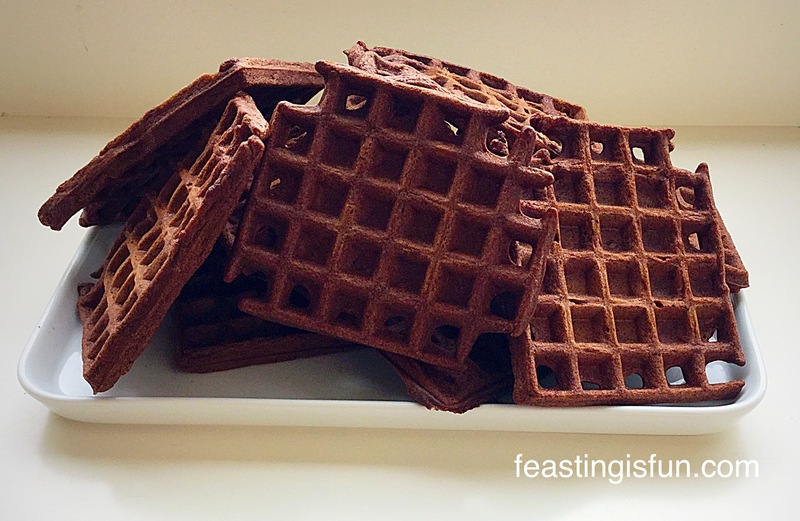 Chocolate Dunking Waffles perfect with hot chocolate. 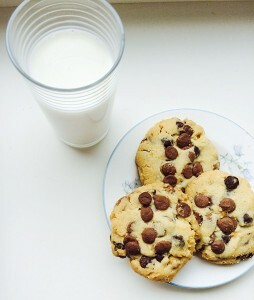 What would be your favourite drink to dunk these delicious beauties in? Traditionally we always make the children a mug of hot chocolate during the midst of summer, when they have spent a rather long time in our rather large paddling pool. These Chocolate Dunking Waffles would be perfect, especially if the hot chocolate has a scoop of ice cream in the top!! If you make these, or any of my recipes, please pop a photo up on social media – @sammiefeasting Twitter/Instagram/Pinterest for me to see. I’m always amazed and inspired by your efforts, especially when you use one of my recipes. Vanilla Bean Waffles as pretty to look at as they are delicious to eat! Cheer Up Chocolate Chip Cookies – a hug in cookie form. This site has fun in its name. 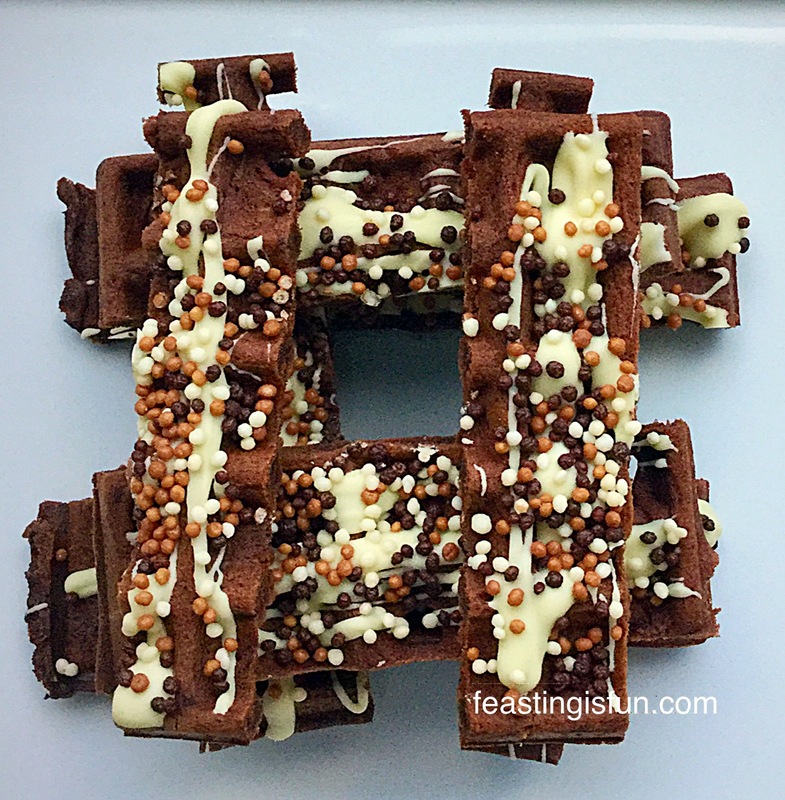 I really hope that you do have fun whilst feasting on these delicious Chocolate Dunking Waffles. All opinions and content are my own. Please see my Disclosure Policy.